Gas lights are coming back to gardens after almost a century's absence. Gas lights are not as well suited to everyday use as electric lights but they are brilliantly suited to party use. The gas supply can be from a cylinder or from a mains supply. 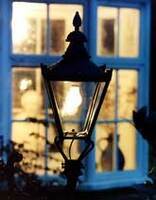 Gas was the fuel which made outdoor domestic lighting pracfical. It attracted talented designers and they produced a range of fittings, which are now offered as electric lights but can also be obtained as gas lanterns. Gas gives a softer light and has the advantage of functioning as an emergency light if there is a power cut. Natural gas burns with a colder light than coal gas, which was the original fuel for gas lights. There are in fact many reasons for illuminating a garden: to extend the use of outdoor sitting areas, to illuminate paths, drives, and steps, and to create a night-time scene which can be viewed from the comfort of indoors. A range of modern lights, in keeping with modern architecture, is available. For older properties, traditional designs are also available. The design traditions come from oil and gas. Both were a source of wonder in the nineteenth century and inspired a series of designs which are distinguished by their elegance and durability. Electric and gas lights should be installed by qualified contractors. Oil lights should be placed where they cannot be upset.